Today's post, like the previous one , features a development project that the PSF has been delighted to fund once again this year. Looking for somewhere to host your open source projects documentation in a way that will make it readily available, easy to find, fully searchable for your users, and exportable in PDF format, while at the same time offering you ease of use and the ability to add content as your project develops? Then, youll want to check out Read the Docs , the worlds largest documentation website for open source projects. hosts documentation, making it fully searchable and easy to find. You can import your docs using any major version control system, including Mercurial, Git, Subversion, and Bazaar. We support webhooks so your docs get built when you commit code. Theres also support for versioning so you can build docs from tags and branches of your code in your repository. 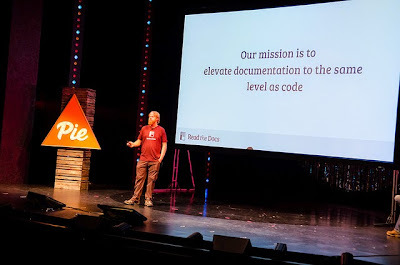 RTD was created in 2010 by Eric Holscher, Charles Leifer, and Bobby Grace for the 2010 Django Dash. Eric tells the interesting story at Djangocon . A Django Dash is a coding contest that allows 48 hours for development and implementation of a project. Eric and his team considered what to do and decided that, since current documentation hosting was less than satisfactory, they could be of most help to the community by creating a web-based doc hosting solution. They agreed that Sphinx was the best document tool for Python, so they went with that. According to Eric, 2011 was the year that saw RTD go from a hobby project, into something projects depended on. At that point, they were hosting documentation for Celery, Fabric, Nose, py.test, Virtualenv, Pip, Django CMS, Django, Grapelli/Floppyforms/Sentry, mod_wsgi. Currently, they are hosting what Eric describes as a decent part of the Python ecosystem, including SQL Academy, Pyramid, Requests, Minecraft Overviewer, and many others. They have over 50 contributors, 7500 users, and get over 15,000,000 pageviews a month. The code for RTD is on GitHub and its documentation can be found on the site. Rackspace provides free hosting. A full list of features is available on the site. The PSF award was part of a fundraising drive that opened at PyCon 2015 and brought in $24,000 USD from 157 contributions since then (see the RTD Blog ). Corporate sponsors included Twilio, Sentry, DreamHost, and Lincoln Loop; with service sponsorships from Elastic Search, MaxCDN, and Gandi. Furthermore, RTD intends to document its use of PSF grant money; how development time is spent and how funds are allocated will be posted on RTDs public Trello board . If youd like to help, you can contribute to RTD at Gratipay and you can follow them on Twitter .